They tell you not to buy the first horse you try. This no doubt holds doubly true when “you” are a collection of pre-teen girls, and the horse is the first one you will ever own. There’s too much excitement, too much of a tendency to confuse that excitement for love at first sight, too much risk. We had that advice firmly in mind when we were finally ready to take the ownership plunge. One Saturday afternoon Ada, Audrey and I piled into a pickup truck with our then-new trainer Charles Zwicky and set off to see a man about a horse. Charles had already done some looking on our behalf, but for Ada and Audrey this was test ride No. 1. We told ourselves along the way that this was just the first horse we’d look at. We might like him, but there would be more. We shouldn’t get too excited. We should be sure to notice that there was no trailer behind the truck. This process could take a while. You sense where this is going: A couple days later he was at the barn for a more extended trial. We never tried another. He came to us with the name “Speed Thru Traffic,” an Iowa-bred Appendix Quarter Horse whose barn name “Cash” no doubt arose out of his lineage. He’s a great grandson of Dash For Cash, and a grandson of First Down Dash, and as far as I can tell that’s a pretty nice bloodline for a Quarter Horse. His performance at the track never lived up to this billing, though. He raced 18 times and won exactly once. For a short while it wasn’t so clear that he’d do much better in the hunter/jumper world, and there were moments when we faced what seemed like it might be a cautionary tale about love at first sight. He was a bit strong sometimes, with the occasional buck. He loved the left lead but not the right. He didn’t do poorly at the first couple shows we took him to, but something seemed to remind him of the racetrack, and it was a challenge to keep him calm. And so we learned how to longe, and we learned that it was usually more fun for all of us to let him work off his energy by turning him loose for a while in an empty indoor ring. He would sprint and buck and squeal and finally pause to roll. And then he’d be an agreeable ride. Soon time and training began to work their magic. He never loved to change from his left lead to his right, but he would do it. As a jumper he was as honest as they come, which allowed the girls to focus on other things. Trainers from other barns started to make unsolicited comments about what a nice horse he was. Ada, Audrey and Laura each had a chance to show Cash the first summer we had him, and he won blue ribbons and championships for each of them, from ground poles to 2’3”. A summer later Ada showed him as high as 3’6”. The summer after that he got a new name (“Walk The Line”) and a job on the A-circuit. He was up for it, and he brought back at least one blue ribbon from each of those shows. There were, of course, bumps in the road. He never completely got over throwing in the occasional buck. A handful of times he refused in competition, and in particular he seemed to have something against jumps featuring sailboat-themed standards. He once refused a tricky fence in a medal finals and then, at the end of what had already been a very long day, spent 45 minutes refusing to get on the trailer to go home. But we all have our bad days and our bad moments, and his were rare. Most of the time he was—and here’s the part where you have to conjure up your best “talking to a gelding” voice—a good boy. I find it hard to capture my affection for Cash. I never rode him, so I can’t claim to have developed that sort of bond. The rest of it sounds trite. Was it the way that he always seemed to take a step or two forward when he saw me coming? The way he’d smack his lips? How he seemed to enjoy it when I’d sneak into his stall at shows to hang out for a bit? No doubt part of it was his role at an early stage of my daughters’ journey, when everything still stretched ahead, when most of what seemed to exist was possibility. And then how he, and Charles, helped to turn possibility into reality. It was all this and more, plus that undefinable whatever-it-is that makes some people, and animals, especially suitable companions. It’s natural to want to pull for the underdog. And it’s easy to imagine that the storybook ending can be your ending, that maybe, just maybe, there’s room for a horse plucked from obscurity—for your horse plucked from obscurity—to shine on the big stage. But you’ve probably noticed that I’ve written in the past tense. For all his virtues, it became clear that Cash would not be the horse to make big dreams come true. Iowa (and near-Iowa) farm boys can clean up pretty well, but black-tie affairs are not their natural habitat. We knew from the beginning that this would be the conclusion of their partnership, and the week was no easier for it. Still, Cash got her there, he got her through it (with a buck or two for old times’ sake), and at the end he got on the trailer like a perfect gentleman. A few days later he was gone, to a great new home and new children to teach. When we got Cash I imagined that we would always have him. For a while our plan was to get a few acres so we’d have a place to keep him when he retired. There’d be times, I thought, when I’d wander out to the field, and we’d just stand next to one another, enjoying the company and looking back on the journey and how we worked together to help raise three independent young women. It won’t happen that way, and while his new situation is by all accounts a good one, there are days, many days when I feel like I didn’t hold up my end of the bargain. The tradeoffs we make are not always clearly to the good. We’re left with photographs and memories. When I think of him now I tend to imagine him mid-course, just coming out of the turn at the far end of the ring on his favored left lead. His manner is one of yeoman-like determination, his rhythmic puffing reminiscent of an old John Deere tractor. He is handsome but not pretty, solid but not flashy, the perfect embodiment of his Iowa roots. He has a job to finish, and he will do it to the best of his ability. As for me, I never imagined I would develop an attachment to a horse. But I did. And I don’t mind saying that I miss him. Chad Oldfather is the blogging COTH Horse Dad. He’s the non-horsey father of two junior hunter/jumper/equitation riders, and he’s going to take readers along on his horse show-parenting journey. By day, he’s a law professor in Wisconsin, but on weekends and evenings, he can be found, laptop in hand, ringside at a lesson or show. 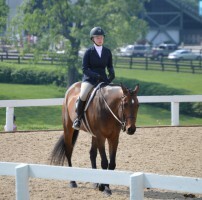 Read his first blog, “My Soul For An Equitation Horse” to get to know him.